The month of March saw International Women’s Day 2019 celebrated and IOEE Centre of Excellence the University of South Wales held a partnership event called “It’s About Time!”. The event involved well over 100 women who own businesses in South Wales and was based on ongoing research with women who are entrepreneurs and mothers with a view to better understanding their experiences. Christine Atkinson, Head of the Women’s Entrepreneurship Hub, University of South Wales, says, “A unique confluence of female entrepreneurship policy developments underpinned the inaugural event in a new collaborative campaign in Wales on International Women’s Day, 8th March 2019, the response to which far exceeded our expectations and further strengthens our commitment to partnership working”. 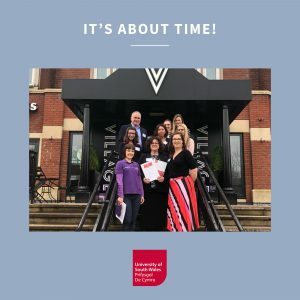 The “It’s About Time!” Summit arose from a collaboration between the University of South Wales, NatWest, BizMums South Wales, FSB and Darwin Gray Solicitors (Cardiff). With confirmation that only 1 in 3 UK entrepreneurs is female and that the proportion of women owned businesses in Wales stands at around 28%, the partnership came together to address this well established under representation of women in entrepreneurship. The theme of the event, the impact and influence of ‘time’, is one of several emerging from ongoing research being conducted by the partnership into the experiences of women who are entrepreneurs and mothers. Role model keynote speakers Andrea Callanan (International Speaker, Coach, Author and Founder of Inspire Me) and Jennifer Barnfield (The PEPP Method) gave insights into their experiences of learning to understand and use time effectively in their exciting and busy lives. In the Foreword to this highly significant new approach, Ken Skates AM, Minister for Economy & Transport sets out the commitment and ambition of Wales: “By encouraging, supporting and increasing the number of women entrepreneurs we will help create a Wales that is prosperous and economically secure, and make Wales a country that leads the way for women entrepreneurs to start, grow and develop their businesses”. With a general positive response to both initiatives for the priority placed on addressing key barriers and strengthening business support experienced by female entrepreneurs at all stages of business, there was a strong call for conversion of policy into action. Participants were invited to make their contribution by pledging their own individual commitment towards positive change.